The Reunions of the Rocky Mountaineer's of 1995 - Ireland 2006. The Rocky Mountaineer's Reunion - Ireland, June 2006. Last Updated October 12, 2008.
visiting this site since July 8, 2006. Group photo at the Atlantic beach in An Cla'cha'n. 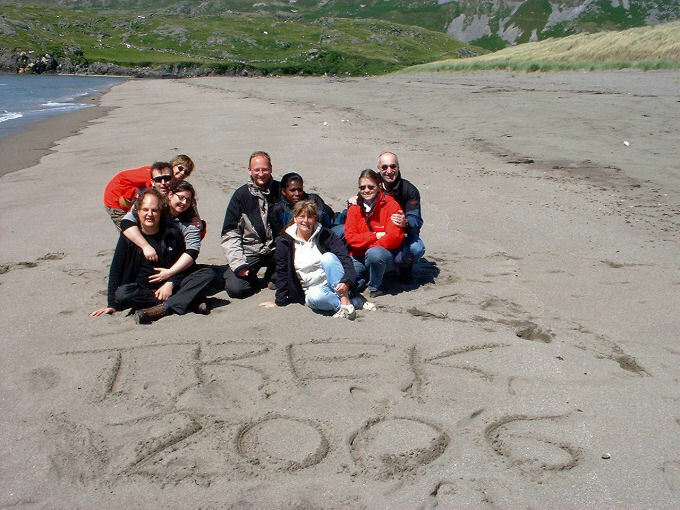 So was it then time for our Year 2006 reunion, this time on the west coast of Ireland, arranged by Christoph. We had rented a very nice house in the village of Laghey outside Donegal Town and was cruising around in the area for the next few days. Some of us flew in to Ireland the day before we were going to meet up in Laghey and some of us were already at Ireland since a few days back. Those of us that flew in the day before; we drove towards Donegal and did some sightseeing on the way. This was my first visit to Ireland and I was pretty excited about this and let me assure you that it was absolutely fantastic. All this history that goes back thousands of years is extremely interesting. The small entrance to the NewGrange passage tomb. View from our house in Laghey. The gang is preparing for our first dinner. The gang is admiring the view at the Teelin Cliffs. Our first group photo by the mighty Teelin Cliffs. The giant mighty Teeling Cliffs. The An Cla'cha'n Folk Village Museum. Beautifully view on the road to portnoo. The town portnoo by the Atlantic Ocean. Dennis and Christoph are doing the barbeque thing. Andrew taking a photo of the beautifully sunset. View of the sunset from our house in Laghey. Last Updated October 12, 2008 - 10:40 CET.